The Niels Bohr Institute has received two large research grants totalling approximately 35 million kroner from the European Research Council, ERC. The two recipients are Eugene Polzik, professor and head of the research centre Quantop and Jan Ambjørn professor with the research group Theoretical Particle Physics and Cosmology. The European Research Council, ERC, Advanced Grant was established in 2008 and only five Danish researchers in the sciences have previously received this grant. This year the ERC received 2284 applications, all of which were of a very high standard. That the Niels Bohr Institute is receiving two grants in a single year is a remarkable success. Professor Eugene Polzik, head of the research centre Quantop at the Niels Bohr Institute at the University of Copenhagen, has received the very prestigious research grant, Advanced Grant, from the European Research Council, ERC. The grant of 18 million kroner will be distributed over 5 years. 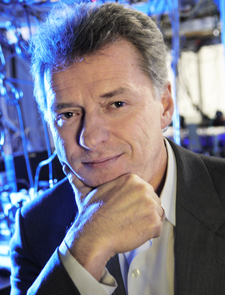 “Eugene Polzik is one of the world’s leading researchers in the fields of experimental quantum optics and quantum communication. He has built up a very strong research environment of the highest quality and demonstrated the capacity to carry out groundbreaking new research and achieve breakthrough results”, reads the ERC’s justification for the awarding of the Advanced Grant. “I am very pleased to receive this Advanced Grant. It will provide my research group with the opportunity to maintain the active research environment, which was initiated with funding from the Danish National Research Foundation”, says Eugene Polzik. He adds that these grants are not paralleled anywhere else in the world. The ERC Advanced Grants provide unique opportunities for researchers who want to work in Europe – both because of the size of the grand and due to the fact that ERC does not limit the freedom of research. In Quantop’s laboratories the research group performs experiments with the entanglement of gas clouds of atoms, light and mechanical nano-membranes. Entanglement is strange phenomenon in quantum mechanics, which means that two separate systems can be entangled, and even from a distance and without a direct connection with each other, the two systems will have a spooky kind of connection. The new project is called 'Quantum optical interfaces for atoms and nano-electro-mechanical systems'. Quantum interface deals with the transferring of quantum states and achieving entanglement between different systems such as light and atoms and will play an increasing role in the development of quantum technology. The development of such systems for transferring is crucial to the processing of quantum communication. The quantum communication of the future will be revolutionary. You will be able to send information securely from one computer to another without the possibility for the information to be stolen or read along the way. “In this project we will develop an integrated and scalable atom-light transfer and will incorporate it into a hybrid quantum network together with other relevant quantum systems, such as nano-mechanical oscillators and electronic circuits. In addition, we have the ambitious goal that we want to develop atomic quantum memories that can operate at room temperature. This will be a step towards practical quantum technologies”, explains Eugene Polzik. “The project has the potential to result in a major breakthrough”, reads the evaluation from ERC. With the new grant of 18 million kroner Eugene Polzik will be able to expand his research team with 6 new PhD and postdoctoral positions. Professor Jan Ambjørn, Niels Bohr Institute at the University of Copenhagen has received a prestigious research grant of 16½ million kroner from the European Research Council, ERC's Advanced Grant. 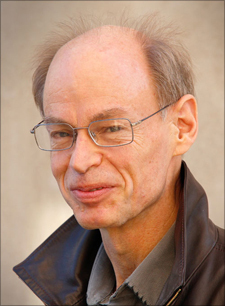 Jan Ambjørn is a professor in the research group Theoretical Particle Physics and Cosmology and his research seeks to uncover the laws of nature that governed the creation of our universe. There are two theories that explain different aspects of the cosmos: Einstein’s general theory of relativity explains the macro-cosmos, for example, how planets move around the Sun, the movements of the galaxies and how the universe behaves as a whole, i.e. space and time over long distance. Quantum mechanics describes the micro-cosmos, i.e. how electrons and protons behave and how light is emitted from the atoms. “But the two theories don’t ‘talk’ to each other. Around the time of the Big Bang, Einstein’s general theory of relativity, which describes the cosmos, meets with quantum mechanics, which describes the micro-cosmos. An understanding of the Big Bang therefore requires a theory that unites quantum mechanics with the general theory of relativity”, explains Jan Ambjørn. Over the last 40 years there have been many attempt to unite these two theories. The most famous of these is probably string theory, which predicts that space has more than three dimensions and a lot of particles we have yet to observe. The theory put forward by Jan Ambjørn and his collaborators, J. Jurkiewicz at Jagellonian University, Krakow and R. Loll at Utrecht University, is much simpler. It tries to directly quantize space-time, which is the basis of Einstein’s general theory of relativity, without involving other particles and forces than those we currently know. The theory can be examined by using computer simulations. In these computer simulations space-time is divided into small causal domains, a technique which gave the theory the somewhat technical name “CDT”, meaning “causal dynamical triangulations”. The computer simulations make it possible to study ‘universes’ that are so small that they are dominated by quantum fluctuations and these studies will hopefully teach us more about the Big Bang. ”Jan Ambjørn is an outstanding theoretical physicist with very impressive scientific research in many areas. He is recognised for his originality and his unique analytical and numerical skills. The aim of his research project is the further development of the particularly interesting theory of quantum gravity, which his is the originator of”, stated the European Research Council in its explanation for the awarding of the Advanced Grant to Jan Ambjørn. The research project will be conducted in collaboration with J. Jurkiewicz and R. Loll and the colleagues Niels Obers and Charlotte Fløe Kristjansen from the Niels Bohr Institute. The grant of 16½ million kroner over 5 years will mean 2-3 new PhD and 2-3 new postdoctoral positions in the research group.